The Pre-Trib Rapture: A House Without A Foundation! PART 5: Forsaking Fables – Let's Get It Right! The Bible is such an immense and majestic book! And in its pages we find such enormous promise from our Creator; an all powerful God who is absolutely true to his words. But not all of those promises are of a positive nature. Many are warnings of consequence! Like these words above from the book of Jonah. As I have shared before, some of the most frightening words (and yes we should be frightened by God’s warnings!) that I have ever read in the Bible are the words of our Lord in Matthew 15:9: ‘But in vain they do worship me, teaching for doctrines the commandments of men.’! How much consideration have you ever given to those words? That you can worship God in vain? I find very sobering the thought that a lifetime of religious devotion could end up having been merely an exercise in vanity if that devotion was not according to the truth. The thought that many, who will be expecting salvation after this life has run its course, will be turned away on the day of Judgment. Cut off from their hope of eternal bliss! Not because they didn’t believe in Jesus (even the devils believe), or because they didn’t anchor their vessel in the harbor of the ‘Christian Faith’; but because they chose to follow false teachings instead of embracing a love for the truth of God’s holy Word! Instead of being filled with ‘truth in the inward parts’ they were filled with the lying vanities man had tickled their ears with. Followers of fables! 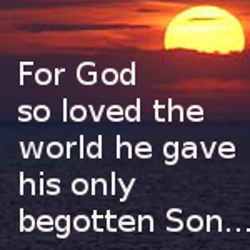 There came a time when the Apostle Paul revealed to his disciple that the day of his departure was at hand (2Tim. 4:6-8); and he gave him a most serious charge. What was this vital instruction he would leave in the hands of the Body of Christ? If the charge to patiently promote and safeguard sound doctrine (including reproving, rebuking, and exhorting) was considered a crucial role of the early Church, how much more critical should we view that charge in these the final days of this age? I believe it is actually a matter of life or death! False teachings and fables of fantasy are a pollution and a defilement to the heart of those who are ensnared by their satanic lure. They are not merely a benign malady that, although certainly unwelcome, does little to affect the long term spiritual health of the victim. No! They are like a malignant cancer that eats away at true faith and replaces it with a religious delusion! Satanic deception carries with it an ability to give you a sense of spiritual well-being that is not in accord with your actual state! The danger of this cannot be over stated! Imagine a lethal snakebite that has the ability to convince someone they were never bitten. A sense of well-being that would prevent the victim from seeking an antidote to the venom. That is a perfect picture of the deluding influence that follows false doctrine! Just because you have a sense of well-being about your belief system does not mean you are walking in the truth. Many are trapped in false teachings because of this deluding influence, and therefor are not stirred to seek remedy. This is why it is crucial that you are able to show your beliefs plainly and clearly stated in the Scriptures. Anything less is foolhardy. Placing your confidence in the sincerity (or proper education) of another whom you trust is risky business when your eternal fate is at stake! What if they are mistaken? Your salvation is not safe if you are depending upon anyone else (including me!) to feed you a stream of pure truth. I am not saying you have to know the Bible inside and out to be saved. But I am saying that the basic tenants of what you hear preached should be easy to find and clearly expressed in the Scriptures; and if not then what is being taught ought to be held in serious question. And you do have every right (and even obligation) to question what you hear preached and taught by someone (including me); and DEMAND clear and concise foundation in the Word of God for the various aspects of those ‘Bible Truths’. All true biblical teaching will hold up to that standard. It will actually be expressed in the text of the Scriptures! I am not talking about *snippets of verse taken out of context, or teaching by implicit reference (teaching that uses only verses that may or may not imply what is being claimed). The important aspects of the doctrines of our faith are clearly and plainly stated with multiplicity of witness in the Word of God! When we shine that light upon false teaching, and give it critical examination, its lack of biblical foundation exposes it for what it is. 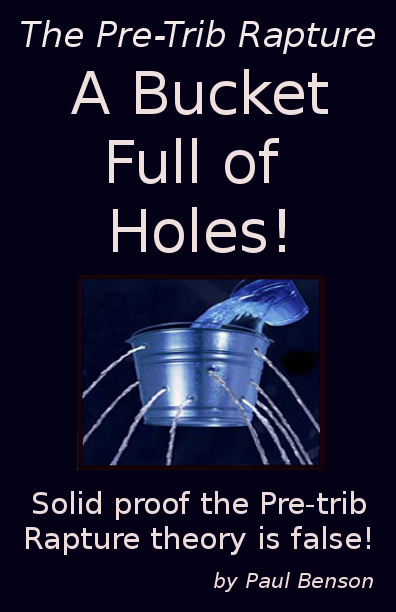 *In my book ‘The Pretrib Rapture: A Bucket Full of Holes’ I show conclusively that the pre-trib teaching is built entirely upon snippets of verse taken out of context, unfounded statements of implicit reference, and even outright lies. It is an easy-read that you can probably get through in a couple of evenings. Nothing complicated or technical; just a common sense look at what the Bible actually does say and what it does not. You can download a FREE copy of that book RIGHT HERE. As we have clearly seen in this series, the various aspects of the pre-trib theory we have examined do NOT have foundation in the Word of God. We could easily expand this series greatly and show that same shortfall for all other aspects of that fable. It exists only in the mind of those convinced to accept it. It is a notion that has to be preconceived and then inserted into the narrative by deceitful means. It’s not something the Bible organically presents to the reader. All they can do is resort to deceptive tactics to convince you of the validity of that teaching. Scripture taken out of context, proofs that have no actual Bible behind them, Scripture wrested to speak what it actually does not, and quite often quoting aspects of their doctrine as proof of other aspects of their doctrine. All couched in great swelling words of vanity! We need to give all those promoting that error the ‘Show Me’ challenge. Show me a ‘rapture that takes us off to Heaven’ in the Bible. Show me an invisible coming of Christ, or multiple end-time comings of Christ described in the Bible, and so on and so on. It is a challenge they cannot rise to. Although many pre-trib preachers are quite crafty and well-spoken, beguiling many a gullible and Scriptural illiterate soul, they cannot show where the Bible plainly and clearly speaks forth the claims they are making. And only God himself can calculate the damage being done by the promotion of that false theology! Because I take such a hard line against deception some might get the idea I am saying anyone who believes in the pre-trib hoax will not be saved. I don’t believe that at all! I don’t want to leave you with the impression God’s judgment upon the deceived will be without a measure of mercy; for he truly is a God of great mercy and great compassion. There will be a marked difference in how the Lord deals with some on this issue compared to others! Please consider these thoughts and I think you will see what I mean: When we come to Christ we are ALL under the influence of error of one sort or another. All of us! Some may be under the influence of false concepts from their religious background or others may be swayed by the antichrist mindset of the unbelieving environment they grew up in. God speaks to those who will listen! No matter where we come from, when we get converted to Christ, our merciful God goes to work to renew our mind with the truth and replace all those erroneous beliefs with proper ones. (And be renewed in the spirit of your mind… Eph. 4:23.) This is a process we must submit to, and apply ourselves to, in order to grow in our faith and conform to the will of God. Those who submit to this process are safe under the mercy and forbearance of God concerning any deception they may unknowingly be harboring! The danger comes from failing to submit to God’s dealings with our mistaken beliefs. Resisting the truth as God reveals it to us is seen by him as a prideful stubborn rebellion! And it can be fatal! This passage from Psalms is a reminder of the destruction that came upon those who ‘erred in their heart and did not know God’s ways’ because they had hardened their heart to his voice. This same warning of the danger of refusing the voice of God is repeated multiple times in the book of Hebrews (Heb. 3:8, 3:15, 4:7). It is crucial we submit to the correction of God concerning our beliefs; and failing to do so will produce the same hardness of heart today as it did to those following Moses in the wilderness. With the same result! That is why there will be a great difference in how the Lord judges falsehood and deception in some compared to others. The newly converted (or those with a diminished learning capacity) will not receive the harsh judgment of those who have for many years turned a deaf ear to the voice of the Holy Spirit as he attempts to turn them from their mistaken beliefs. Those who are humble and willing to learn God’s ways, even though they may still be awash in false notions at the time of their passing, will not receive the punishment awaiting the willfully ignorant who have long refused the truth presented to them! Do you think someone can carry on for a lifetime preaching and teaching that which is not correct and the Lord is not going to deal with them on it? Let’s get real here! God speaks correction to us when were are in error! He would not be a good and loving Father if he did not! If you have people on both sides of this issue, who have been professing faith and promoting themselves as spokespersons for God for many years, but still have opposing views, then someone has been tuning out the voice of the Holy Spirit and hardening their heart to the dealings of God. Where is the wisdom in failing to raise an issue with that reality; instead of sweeping it under the rug? I cannot help but think this ‘I’ll believe what I do, and you believe what you do, and we will just have to agree to disagree’ mindset is not only strong evidence of heresy among us, but that it also is an insult to the God who demands we hearken to the counsel he gives through the leading of the Holy Spirit. Such mentality is little more than slothfulness and compromise gone to seed. It is one more spot on the garment of the Bride of Christ. Spots which will necessitate a trip to the Laundromat of trials and tribulation in order to prepare her for the Groom. It’s coming! Are we so dull of wit we should suppose those holding opposing views on important doctrinal matters are both being led by the Holy Spirit in their studies and preaching? Is the Holy Spirit going to teach opposing views to two different people? No! Someone is listening to lies instead of truth; and then in turn damaging the Body of Christ by teaching those lies. This will not be without grievous consequence to those who have made a lifelong habit of refusing the voice of God. It is a healthy regard for those serious consequences that has driven me to so closely examine what is being preached and taught today; and to demand a clear and evident foundation in the truth of God’s Word for all Christian doctrine. I plead with you in the name of our Lord Jesus Christ to do the same. It could very well save your soul. That means that even when the people cannot endure sound doctrine, PASTORS HAVE TO REMAIN FAITHFUL TO GOD. Unfortunately now in our Laodicean time, the wolves disguised into lambs prefer to please their assembly than please God, for all that they want is attendance and income. Very few people today want to hear sermons about sin, judgment, condemnation, and hell, so these wolves have invented a washed-down false gospel called OSAS (which means Once Saved Always Saved) where people are deceived into believing that they can enjoy everything and commit all kind of sins, and then still go to heaven (or be raptured before the tribulation). That’s why the “church” (if we can call these places “churches”) have become houses of entertainment that look like big theatres, concert hall, community centers, or sport facilities, to satisfy an assembly thirst of vile entertainment. Now there are not even Bibles nor hymns book inside these den of thieves. It’s even impossible to pray there as during praying time are performed horrible sensual music. After the time overhead projectors were used to project music too ugly to be published in printed form, now computer projectors are used to project any types of garbage. I have even heard sermons made to instruct people to NOT give to the poor, telling people that all that they are willing to give must be given to the church only! Great comment! You hit the nail right on the head. If there were not a backslid multitude with an appetite for these fantasies, there would not be the hoard of hirelings we see living off the income their ear-tickling preaching produces. If we give our $$$ to these churches we are part of the problem and not part of the solution. Previous Previous post: HOW TO KNOW YOU ARE RIGHT WITH GOD! 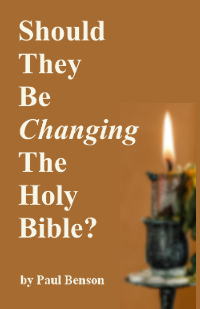 Next Next post: The New Apostolic Reformation: What is it?